Finding a doctor poses an interesting challenge, especially for caregivers looking for a primary doctor for their loved one. Typically, if your loved one has a disability, cancer, chronic illness, or other debilitating condition, you don’t just see one doctor. For Mom, we spent so much time seeing specialists (urologist, neurologist, pulmonologist, etc) that tacking on another appointment with a general practitioner seemed like overkill, especially if she wasn’t experiencing general sickness like a cold or sore throat or anything. 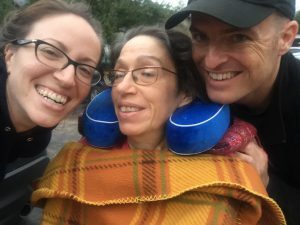 When we moved to Austin, TX, however, Mom developed a rash on her back that we wanted to get seen by a doctor right away (and not an urgent care doctor). We did a little research and happened upon the doctor who would become our saving grace, but a long the way, we learned a handful of important lessons that might help your search for a doctor as well. They Accept Your Loved One’s Insurance: This one seems like a given, but it’s key to check and see that your doctor’s office accepts your insurance be it Medicare, Medicaid, or a private plan before you take your loved one to see them. Many doctor’s have stopped taking Medicare or Medicaid patients simply because of the paper load required to treat someone with that type of insurance as well as fluctuating reimbursement rates from the government. We actually have been asked to schedule appointments with Mom’s doctor at least 3 times a year to essentially make it worth the amount of time they spend on paperwork and other non-reimbursable tasks like working with Mom’s home health agency, writing orders, etc. Good Reviews: Yep, reviews. Just like you might for a restaurant or a movie, checking out doctor’s reviews online could greatly influence your decision. I initially chose Mom’s general practitioner because of the positive reviews I saw for her online from satisfied patients, this meant a lot to us. Some doctor review sites include Zocdoc.com, RateMDs.com, HealthGrades.com, and even Yelp.com has doctor reviews. Location: Anyone who cares for someone with a disability especially knows how difficult a simple trip out of the house can be. For Mom, we have to get her up, diaper changed, bedsore dressed, water drank and snack eaten before we even set the car up for her. “Setting the car up” includes getting pillows situated on her seat correctly, wheelchair with pedals in the trunk, and her boppy and neck pillow at the ready.This doesn’t include packing a backpack with necessities like a diaper and change of clothes just in case, as well as back up thickened water, her IDs, snacks, and even meds in case her appointment overlaps with the time in which she takes medicine. Oh and don’t forget her “in case she has a seizure” medicines and devices. This makes location super important. We needed a doctor that was close, so our entire appoint prep-attend-get home time didn’t take all day. The Type of Primary Doctor: There are many terms for primary doctors – primary care physicians, general practitioners, family doctors, etc. Those types of medical professionals provide a comprehensive array of medical care, while other primary doctors focus on specific age ranges. An internist, like what Mom’s doctor is, focuses care on adults and is more savvy in evaluating and diagnosing a broad range of conditions which afflict adults. A pediatrician does the same thing, except for children, and a geriatrician for older adults. Your own family doctor may not have the range of expertise an internist has to help your aging parent or older loved one. This is something to keep in mind as you continue your search. They Pass Your Interview: As a patient, you absolutely have the right to stop seeing your doctor if they are not providing the care, attention, and efficient treatment your loved one needs. Caregivers know that dealing with doctor’s offices and health insurance companies can be volcanically frustrating. You and your loved one need a reliable treating physician who knows the ins and outs of your loved one’s condition, their situation, and is in the business of truly helping them get better or at least, helping them maintain a quality of life despite their illness. If you want to leave your loved one’s doctor and are listed on their HIPAA release or have other legal jurisdiction (i.e. healthcare power of attorney) you should be able to request your loved one’s records, or have them sent to a new doctor. Thanks for checking out these tips from Give a Care for finding the right doctor for your loved one. What was your experience finding a new doctor? Thanks for these tips for finding a new doctor. I’m glad you mentioned that it could be good to have a doctor that is close, especially in case it takes a while to prep before going there. It also seems very useful if you are in a dire situation and may want help from a doctor quickly. I liked what you said about wanting to make sure that they are in a convenient location for you. We have two daughters and they don’t like spending time in the car. I think that it would be good for us to find a family doctor who is close to their school or to our home. That’s good to know that a primary care physician, general practitioner, and family doctor provide a comprehensive array of medical care. My kids are getting old enough to go to not go to a pediatrician and I was trying to figure out where to take them for comprehensive care. I’ll have to look into family doctors since I think that would fit them the best. 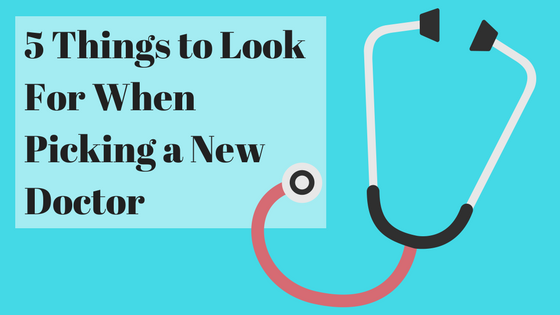 This is some really good information about finding a new doctor. I liked that you pointed out that it would be smart to think about the location of the doctor’s office. I wouldn’t want to travel a long distance to get to the doctors. Since I need to get a new doctor soon so this is good to know. Thank you for suggesting that you should go with someone that has good reviews. I am needing to find a doctor for my entire family. Hopefully, I can find someone great in my area. We’ve just moved and are looking for a new general practitioner for our family. I really liked your suggestion about looking for positive reviews. I had never heard of Zocdoc.com or RateMDs.com but I will have to check these sites for reviews to find our new doctor. Thanks! I like how you mentioned looking for a primary care doctor and checking reviews before choosing a doctor. I just recently moved to another state and need to find a new doctor. Thanks for the tips on looking for a new doctor. I agree that you should make sure you find a doctor with good reviews. This can definitely influence your decision, like you said. I’m glad you listed some reputable review sites. It was interesting when you said that the decision of choosing a doctor mainly relied on the reviews and that you chose your mom’s doctor based on the review of satisfied clients. I will also do that because I do not know where to start in choosing a family doctor. Looking at reviews will surely be easy as I am always looking things up from my phone. It was great that I saw this article and learned something new. I like how you said that we can check reviews for new doctors just like we can for restaurants or movies. My husband and I recently moved and need to find a new doctor in the area. I didn’t realize that doctors would have reviews to read, so thanks for sharing that tip!